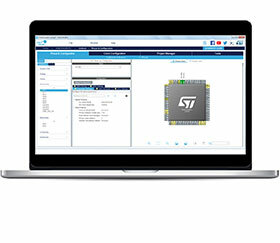 Setting up STM32 microcontroller (MCU) projects is more intuitive and efficient using STMicroelectronics’ latest release of the STM32CubeMX configuration tool. With its modern multi-panel GUI that lets users visualise and do more without changing screen view, STM32CubeMX v.5.0 makes optimising MCU configuration parameters easier and more comfortable. STM32CubeMX kickstarts embedded projects by helping users to select the right STM32 device from the family of over 800 variants and configure the basic hardware features appropriately, before automatically generating the MCU initialisation code. Users can take advantage of powerful device configuration utilities, including a pinout selector with conflict solver, help with clock-tree settings, and a power consumption calculator for accurate early-stage assessment of energy requirements and power-saving opportunities. There are also tools for configuring peripherals and middleware stacks, such as TCP/IP or USB stacks, and support for dynamic validation of parameter constraints.